The Building Directive ‘s recast will probably introduce a voluntary common EU certification for non-residential buildings from 2012 onward. Why not start doing this straight away by using Display®. Use the unique European label which is easy to edit and easy to understand! 1. Download the Members’ Charter (see below) and send two signed copies back to us. 2. As soon as we have received the Charters, we will send you an invoice for the participants fee to use the Display® calculation tool which is for free for Energie-Cités members. You will also receive a copy of the communication handbook. 3. In parallel, please fill in the online registration questionnaire. As soon as we have received confirmation of your payment you will receive a password that gives you access to the participants section. Any European municipality, independent school and private company can take part in the Display® Campaign, whatever its size, the number & dimension of its buildings or its level of knowledge regarding energy consumption, CO2 emissions and water consumption. The applicant must follow the ethic of Display i.e. focus on the use of new forms of communication to raise awareness on energy and water consumption issues. 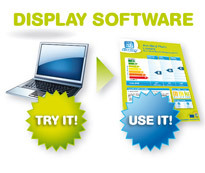 All participants have to pay an initial registration fee for using the Display® software, communication aids and tools. This allows users access for one year and then users have to pay an annual maintenance fee to continue using the tool. *New Member States (until the end of 2011), other East-European countries, non EU cities. The registration is free for Members of Energy Cities. As you may be aware, the European Commission’s financial support of Display® reached its end in April 2011. Therefore, in order for Display® to continue offering the same level of support to its users we have been forced to re-apply an annual maintenance fee for all participants that are not Energy Cities members. This financial solution was initially used at the beginning of the campaign but due to our long run of EU support was not essential to the Campaigns sustainability. Times change and strategies need to be adapted. That is why starting from 2012 an annual maintenance fee structure will apply. Please note that the inscription fee for new members will remain the same and include a maintenance fee.